Samsung announced a record $8.5 billion in operating profit, beating the $8.3 billion guidance it released early this month. That's up from the $7.9 billion from the previous quarter and $5.8 billion from the year ago quarter. Net profit was $6.99 billion. We were a little wary of reports that Samsung had beaten Apple in profitability, but the Cupertino company (and Samsung's main smartphone rival) posted a net profit of $6.9 billion, coming a narrow second this time. Sales are up across the board for the Samsung divisions, but mobile division actually marked a decrease in operating profit quarter on quarter (it's up YoY), despite the launch of the Galaxy S4 flagship, which has been selling quite well (but not as well as some analysts expected). Analysts say that while Samsung and Apple dominate the high-end smartphone market, that market has been saturated and the action is now in the mid- and low-end segments. Samsung has carved out a 30.4% market share (down from 32.2%) despite sales rising 43.9% (Apple's sales rose 20%). Apple doesn’t compete in the low-end just yet, but Samsung does. However, companies like LG and Lenovo saw their sales double and stronger competition from HTC, Sony and Nokia have made things more difficult for Samsung, while the increased spending on R&D and marketing didn’t help either. Regional growth in sales in America and China is largely due to the launch of the Galaxy S4, which lead sales overall. Smartphone demand increased slightly, despite the weak seasonality. Samsung expect next quarter to see continued growth with LTE driving it in developed markets and emerging markets like China to gobble up mass-market smartphones. Samsung's tablets were on the rise in emerging markets, but went down in developed markets. 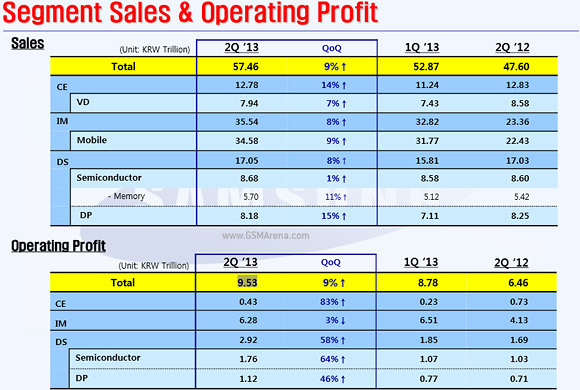 Samsung expects high growth in both markets next quarter despite stiffer competition. Samsung's semiconductor business is seeing low desktop demand but strong mobile and server sales, with growing demand for NAND memory for SSD and phone/tablet storage. DRAM shipments increased and will only go up thanks to demand for graphics memory for the new consoles (Xbox One and PS4). Samsung's TV and panel business is on the rise too, with increasing average selling price thanks to demand large TVs (60+ inches) and the new UHD panels. You can get more numbers on Samsung's various divisions in the press release (PDF).